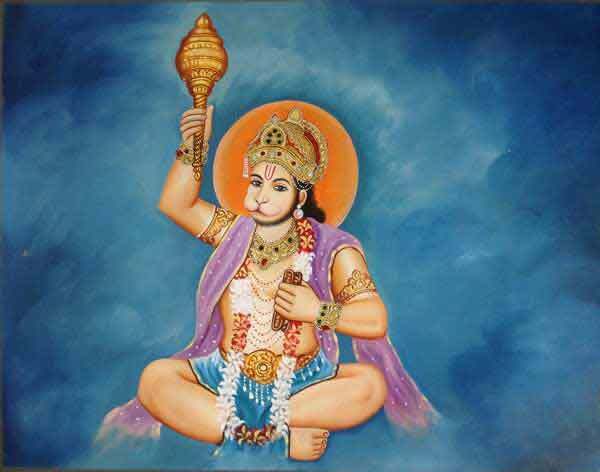 Makardhwaj is the son of Hanuman as per certain versions of Ramayana popular in different parts o India. It must be noted here that Makardhwaj is not mentioned in the Valmiki Ramayana. The story of son of Hanuman is found in Sanskrit Adhbut Ramayan - retelling of Ramayan based on the culture of the eastern parts of India. Story of birth of Makardhwaj is associated with Hanuman burning down Lanka. When Hanuman first visited Lanka in search of Mata Sita, Ravana, the demon king of Lanka, had set Hanuman’s tail on fire. The fire did not burn Hanuman but he used it to burn down Lanka. After destroying Lanka, Hanuman extinguished the fire by dipping the burning tail in the ocean. When Hanuman was extinguishing the fire on this tail, a drop of sweat fell in the ocean which was swallowed by a crocodile (makara in Sanskrit). As a result of which, a child was born to the makara (crocodile). The child born to a crocodile was named as ‘Makardhwaj’. Hanuman meets Makardhwaj when he goes to Patal Lok to rescue Bhagvan Sri Ram and Lakshman who were kidnapped by Ahi and Mahi Ravana. Hanuman goes to Patala to rescue Bhagavan Sri Ram and Lakshman, but He is stopped by an unusual being - half fish and half monkey. A fight ensued between Hanuman and the unusual creature. Hanuman was unable to defeat the unusual creature and He realized that the creature possesed divine strength. Upon enquiry, Hanuman finds that the unusual being is his son who was born to a fish. A fish had consumed a sweat drop fell from Hanuman while he was flying across to Lanka. The fish was caught and brought to the palace of Ahiravana. When the fish was cut open, the unusual being was born. Hanuman reveals to the creature that He is Hanuman. The creature bows to his father and lets him pass into the patala loka and also tells him secrets of the underworld.